Groups representing survivors and families of victims of Quebec mass shootings say they fear Ottawa won't take promised action to ban assault weapons before the next election. The groups, which include gun-control advocates with ties to École Polytechnique, Dawson College and the Quebec Islamic Cultural Centre — all scenes of deadly shootings — met with MP Peter Schiefke, parliamentary secretary to Border Security and Organized Crime Reduction Minister Bill Blair, Thursday. Speaking to reporters after the meeting, they said they were happy the government was showing a willingness to listen, but they were left with the impression a bill would not be tabled before the 2019 federal election. 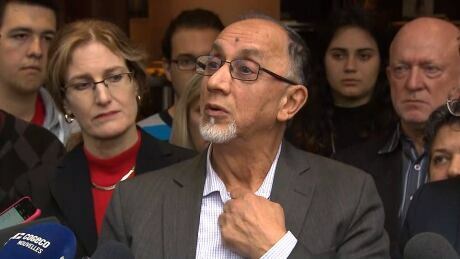 "We plead, we ask, and yet it's not being made concrete," said Boufeldja Benabdallah, co-founder of the Quebec City mosque where six worshippers were gunned down in January 2017. "We're not in a war-torn country: weapons of war must be prohibited." Gun-control advocate Heidi Rathjen has said it was troubling that such a ban wasn't part of Bill C-71 — legislation tabled last March to tighten Canada's firearms law, including enhanced background checks for obtaining a firearms licence and mandatory record-keeping for vendors. Trudeau asked Blair to lead the current probe into a possible ban after a series of deadly gun incidents this year, including a mass shooting on Toronto's Danforth Avenue in July that killed an 18-year-old woman and a 10-year-old girl and injured 13 others. Blair, who announced the invitation-only consultations this month, has said he wants them completed by the end of the year with a report coming in early 2019. Benabdallah said he and other stakeholders at the meeting suggested interim measures that could be taken until a bill is passed, including awareness campaigns. "We're inundated by information on pot, but have you heard about assault weapons going around?" Benabdallah recounted to reporters recently being accosted by a stranger near the Quebec City mosque who told him to "stop whining." "People can kill, but when some complain a little because their loved ones were killed, they are told to stop crying," Benabdallah said. "The government needs to do something so that we, the grieving families, don't have to feel guilty." Rathjen, who is the co-ordinator of PolySeSouvient, a gun-control group formed in the wake of the 1989 Polytechnique massacre, showed examples of assault rifles that can be purchased legally in Canada. "This is the kind of weapon we're speaking about," Rathjen said, holding up the image of a Kel-Tec semi-automatic that weighs about seven pounds. "It's not a hunting weapon. It's not a sport pistol. It's a weapon of war, and it is non-restricted." Rathjen said she was surprised by how strong the gun lobby is in Canada. "Most MPs, most senators have been drowned in letters and emails against gun control by the gun lobby," she said. Rathjen said the conversation about banning assault weapons has been going on since the Polytechnique tragedy 29 years ago. "It's been 29 years since we have had a very clear example of the damage that can be caused, the suffering that's caused, the loss of life, the destruction of families that can happen when one person, one ill-intentioned person, gets their hands on a weapon," she said. "And we have seen many examples since then." Two current Polytechnique students were also at the meeting, representing a new cross-country student movement against assault weapons and handguns. The engineering students, Manuel Klaassen and Wendy Vasquez, said they wanted to highlight the mental health issues around gun control. "Students sometimes feel depressed and have suicidal thoughts. If guns are easily accessible, it makes it easier for them to commit suicide, and we want to prevent that," Vasquez said. Both Montreal and Toronto city councils have called on Ottawa to implement bans on handguns and assault weapons. But opponents — including the Opposition Conservatives — argue it would do little to improve public safety. Rathjen said groups were given about one week's notice of the federal consultation, meaning certain experts are not able to attend.